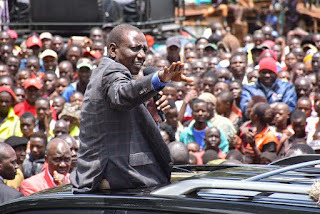 Friday August 24, 2018 - Deputy President William Ruto attacked an unseen madimoni but most Kenyans believe he indirectly attacked President Uhuru Kenyatta for saying only him and National Super Alliance leader, Raila Odinga, understand the nature of the handshake. On Wednesday when he was commemorating the death of Mzee Jomo Kenyatta, Uhuru fired a salvo at those opposing the handshake saying it is only him and Raila Odinga who understand what the handshake means to Kenyans. Ruto, who was attending the memorial, seems to be angered by the remark and took to the social media accusing Uhuru and Raila Odinga of trying to sabotage his 2022 presidential bid. “Those running 'injili ya shetani' that unless your father was a minister, a vice president or a president however hard you work you must remain poor and if not a pauper you must be corrupt & have stolen, they should know that those without god fathers we have GOD the father. Shindwe," Ruto said in a tweet that he later deleted. President Uhuru's father, Jomo Kenyatta and Raila's dad Jaramogi Oginga Odinga were once President and Vice President respectively. However, others believe he was accusing his ghost political opponents who possibly sponsored the IPSOS poll.